What is one of the simplest way to reduce energy use? Harness the power of the sun and wind to dry your clothes! Line drying saves money and extends the life of your clothes. Plus, there’s nothing like the fresh smell of line dried clothes. Did you know line drying your clothes is now “in”? More and more people are discovering the benefits of line drying. Line drying your clothes is easy and has many benefits. Line drying saves energy and money and also extends the life of your clothes by reducing heat damage, shrinking, and wear and tear. Even better—enjoy a few moments outside in the sunshine! Curious? Just try it out. You can purchase a clothesline and some clothespins for $20 or less to get started. Start off with a few loads and see how it goes. Remember, line drying doesn’t have to be an all or nothing thing. Consider hang drying some of the quick-drying items in your closet. Athletic clothes made from synthetic materials are a great place to start. Follow the tips below to get started! Although stringing some rope across the yard might seem sufficient, spending a few dollars to invest in a clothesline is well worth it. For outdoors, consider starting off with a retractable line. The average load of laundry uses about 35 feet of line, so look for something close to this capacity. 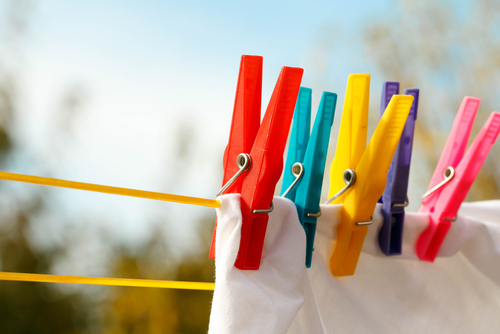 The same holds for clothespins—invest in a good sturdy set and they will last. It is best to store clothespins inside when not in use. When installing your clothesline, find a location with some sun exposure, some shade, and good airflow. Stay away from trees that can drop sap or leaves on your clean clothes. Right to dry rules. If you live in an apartment or HOA, first check for any restrictions on the use of outdoor clotheslines. However, be aware of your rights! There is a “right to dry” movement and 19 states have laws protecting your right to line dry outside. If you’re in one of these states, you are “free” to line dry and apartment owners and homeowners associations cannot restrict residents from line drying. States where line drying is protected: Arizona, California, Colorado, Florida, Hawaii, Illinois, Indiana, Louisiana, Maine, Maryland, Massachusetts, Nevada, New Mexico, North Carolina, Oregon, Texas, Utah, Vermont, Virginia, and Wisconsin. There are some HOAs in these states that have not gotten the memo and still have language restricting drying, so you may need to educate the HOA if the question comes up. Now you have your clothesline up, it’s time to line dry! Here are a few tips and tricks. Ban the wrinkles. To keep your clothes smooth and wrinkle free, follow this rule of thumb: if you wear it on top, hang it from the bottom; if you wear it on bottom, hang it from the top. Hanging your shirts from the hem (not the shoulders) helps prevent puckers caused by the clothespins. Before you hang up your clothes, shake them and then hand smooth out wrinkles. Whites and colors. Hang whites and lights in the sun to brighten and hang darks in the shade to prevent fading. If you don’t have a shady spot, try turning dark clothes inside out to prevent fading. Use clothespins! It might be tempting to just toss your clothes over the line; however, they will take longer to dry and come out with fold lines in weird places. Leave some space between clothes items to help them dry quickly. Stay soft. To avoid stiff or scratchy clothes, you can add half to three-quarters of a cup of white vinegar per wash load, just before the rinse cycle starts. This will keep your clothing soft. Don’t worry—the vinegar odor disappears as the clothes dry. Also, don’t leave clothes out on the line for too long. If they are still not soft enough, you can use good quality fabric softener or throw your clothes in the dryer for a few minutes on fluff when you bring them in. If it’s rainy outside or you just don’t have the space to hang your clothes up on an outdoor clothesline, you can still dry clothes inside. The main trick to indoor drying is to find a spot to hang clothes where they won’t be in the way and annoy you! Luckily, retractable lines or foldable clothes rack can make good use of small spaces and can be put away when not in use. Find a spot. Take a look around your house and find a place for clotheslines or drying racks. Some options might be a clothesline in the basement, a retractable line in the shower, folding racks in a spare room (that can be put away when not in use), and overhead lines or a wall-mounted rack in your laundry room. Dry overnight. Try hang drying clothes indoors overnight. Most clothes can be put away dry by the morning, limiting the impact of drying racks on your household. For faster drying times, use your washing machine’s fastest spin cycle to wring out as much water as possible.